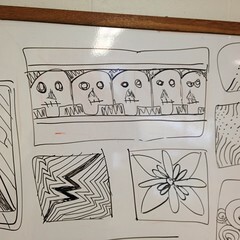 ll of my students in Latin lately have been doing a good deal of Zentangle work. They’re working on a project on Greek and Roman deities. I’ve done this project before, with good results, as part of their effort to produce a miscellany together of their Latin texts. A descriptive bit, that explains who the god or goddess was to the Romans (using a lot of declarative sentences, with transitive and intransitive verbs, and complementary infinitives. An explanation of the god or goddess’s attributes — that is, lots of use of the linking verbs est and sunt, and proper use of adjectives. This is also a chance to show off the three styles of poetic form that we’ve practiced this year — parallelism, chiasm, and epithet (through the use of the genitive case of nouns — you see how I’m using this project to demonstrate learning?). A ‘Prayer to the god or goddess’ — that is, demonstrating the use of the imperative/command form of Latin verbs: “O Juppiter, Domine Fulveorum, adiuve et fert auxilium! Noli me Necare!” That sort of thing. The telling of a myth or story about the god or goddess — again, an effort to use all of the styles of sentences we’ve learned this year, and maybe throw in some ablative of means or instrument or time, since my sixth graders basically won’t have time to learn any tense but the present tense. But the truth is, that if you want your students to do this sort of project, you have to give them the tools to do it. And I’ve been remiss. I should have been including some lessons in hand-writing from the very beginning — not because kids need to know how to write in cursive these days, or even in Italic (although Italic is very beautiful, and easy to learn), but because it’s a thing worth caring about, making writing beautiful. And that means teaching them some of the patterns and borders that you might like to see on their written pages. It doesn’t matter if you want checkerboards, or egg-and-dart, or vines, or acanthus leaves, or waves, or sea-shells. If you want this sort of thing in their work, you have to make it beautiful, and you have to hold the students to a standard of beauty, too. The aesthetics matter. 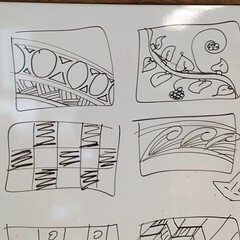 For each of the visual samples here photographed, there was a lesson: in how to draw a ribbon; in how to draw a checkerboard; in how to make egg-and-dart designs, and vines, and abstract wave patterns. Someone is doing Hades/Pluton, so there was even a bit of discussion of how to draw skulls as part of an ongoing border in an illuminated context. When we’re talking about a ‘dead’ language like Latin, the speak and hear components of that training are hard to come by. How do you teach kids to care about that? But more than that, how do you keep it alive in their memory six months from now, ten years from now? The answer seems to be, teach them to make it beautiful. 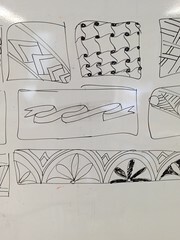 Zentangle designs mixed with Latin, and maybe next year with some handwriting education, is producing an ‘heirloom of their house’, something that apparently their parents and they will treasure for at least a few years. One of my eighth graders just found her sixth grade Latin ‘cardboard codex‘, and had a moment where she just couldn’t even. 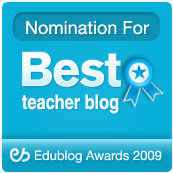 Will it work for every kid? No, probably not. But it will be beautiful to some children, and a reminder of long-ago lessons, and maybe it will be a reminder to adults, that not all languages are spoken, and that the language of picture, of rhythmic use of line and shading, tells another story without using a single word.